The cool wet weather this spring delayed planting for many Wisconsin farmers. As of May 28, USDA reports that only 64% of Wisconsin corn and 29% of soybeans have been planted, well below the 5-year averages of 85% and 60%, respectively. Last year, 70% to 75% of corn and soybean acres in Wisconsin were insured and early reports indicate that the percentage of insured acres is even higher this year. This bulletin quickly reviews crop insurance rules to remind returning growers and to help new growers understand late and prevented planting dates and options as this wet spring continues to develop. 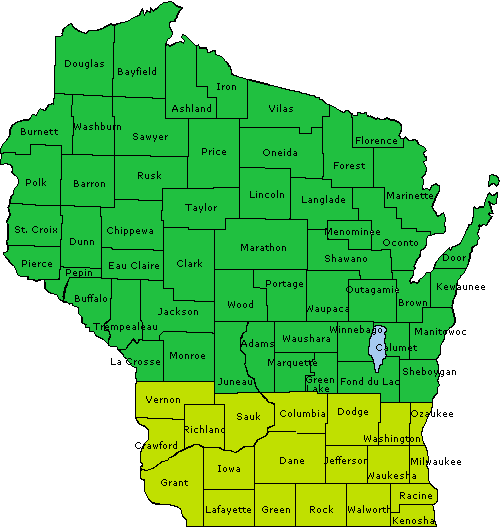 The final planting dates in Wisconsin are May 31 for corn for grain, June 5 for corn for silage, June 10 for soybeans in the northern 2/3 of the state and June 15 for the southern 1/3 of the state (see map for the soybean date in your county). Acres planted after these dates are still insured, but the farmer must notify the crop insurance agent, even if he does not have late and prevented planting coverage. Small areas do not trigger late and prevented planting. The late or prevented planting area must exceed 20 acres or 20% of the unit’s acreage to qualify. Northern counties have a final planting date of June 10. Southern counties have a date of June 15. Once late or prevented planting is triggered, farmers have three options, which should be discussed with their crop insurance agent: 1) The crop can be planted late and the unit’s yield guarantee reduced; 2) A different crop can be planted (which may or may not be insured), including switching from corn for grain to silage or to soybeans or to some sort of forage; or 3) The land can be left fallow and an indemnity received for prevented planting. Farmers prevented from planting by these dates should consult with their crop insurance agent to clearly understand these options and associated restrictions and implications, otherwise they may not claim indemnities they are due or inadvertently forfeit insurance coverage. A 200 acre unit of corn for grain has a yield guarantee of 150 bu/A x 200 A = 30,000 bu. 100 acres are planted before the final planting date of May 31, but 100 acres are planted on June 6, six days after the final planting date. The corn yield guarantee for these 100 acres is reduced 6% (1 % for each day) to 141 bu/A, so that the new yield guarantee for the unit is 150 bu/A x 100 A + 141 bu/A x 100 A = 29,100 bu. If instead the corn was not planted until June 26 (after the late planting period ended), the yield guarantee for these 100 acres is reduced to 90 bu/A (60% of their regular contribution), so that the new yield guarantee for the unit is 150 bu/A x 100 A + 90 bu/A x 100 A = 24,000 bu. If the farmer switched to insuring the corn as silage, only a 1% reduction in the yield guarantee would result, as the final plant date is June 5 for corn silage, so the farmer is only 1 day late. Alternatively, if the farmer planted the 100 acres to soybeans by June 6, no soybean yield guarantee adjustment for late planting would apply. A farmer prevented from planting acreage to the insured crop can choose to plant a different crop (possibly with insurance coverage), or not plant any crop. For example, a farmer prevented from planting corn may elect to plant soybeans instead, and, if soybean insurance has been purchased, can receive insurance coverage for these soybean acres (with reduced coverage for late planting if applicable). Alternatively, a farmer can leave the land fallow and receive a prevented planting indemnity equal to 60% of their yield guarantee (more if higher prevented planting coverage is elected). Farmers leaving land fallow should communicate with their crop insurance agent about allowable activities on this fallow land. For example, grazing or haying a volunteer or cover crop prior to November 1 constitutes a second crop and reduces prevented planting indemnities. Farmers should always check with their crop insurance agent on such practices. Also, remember that leaving land fallow due to prevented planting lowers yield guarantees for later years. If a crop stand is damaged early in the season so that the projected yield is less than 90% of the yield guarantee, a farmer can receive an indemnity for part of the actual cost of replanting. A claim must be field and an insurance adjuster must inspect the stand. The affected area must exceed 20 acres or 20% of the unit’s acreage. The maximum indemnity is the chosen price election multiplied by the 20% of the yield guarantee, up to 8 bu for corn, 3 bu for soybeans and 1 ton for corn silage. The replanted crop has the same production guarantee as for the original plant date (i.e., no reduction for late planting is imposed). Note that the replant option is not available for all policies or crops, so contact your crop insurance agent to clarify. Suppose a 200 acre unit of corn for grain has a yield guarantee of 150 bu/A x 200 A = 30,000 bu with a $5.65/bu price election. All acres are planted before May 31, but cool wet weather reduces the stand to less than 20,000 plants/A on 80 acres of the unit. The farmer can replant these 80 acres to corn and keep the 150 bu/A yield guarantee, even if the corn is replanted after May 31, and receive an indemnity up to $3,616 (8 bu/A x $5.65/bu price election x 80 acres) for the cost of replanting these acres. This bulletin only summarizes crop insurance rules – agronomic considerations such as switching corn maturity dates or from grain to silage should be part of the decision. See the UW Extension corn agronomy web page for more information: http://corn.agronomy.wisc.edu/. Paul Mitchell’s UW Extension Web Page: http://www.aae.wisc.edu/mitchell/extension.htm.